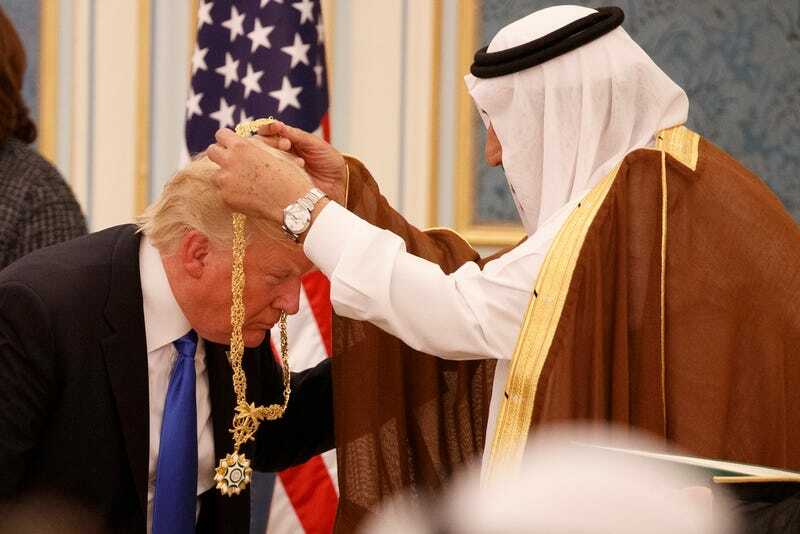 On Saturday, President Trump signed an enormous $110 billion weapons deal with Saudi Arabia. And as you might expect, America’s private military companies are crushing it on the stock market this morning. Virtually every major publicly traded American defense company hit record highs today immediately after the stock market opened. Right now, Lockheed Martin is up 2.4 percent, Northrup Grumman is up about 1 percent, General Dynamics is up about 1.5 percent, and Raytheon is up 1 percent. The weapons deal was one of the largest in history, with American defense companies selling practically everything not tied down. The deal includes everything from tanks and helicopters to plenty of ships and missiles. As CNBC points out, lots of other defense companies were doing well this morning too, including Boeing, which is up 2 percent. But Lockheed is seen as the biggest winner in the arms deal with the Saudis, since the company is selling plenty of its THAAD missile defense systems. The THAAD is currently being deployed by the US in South Korea and became controversial even before President Trump insisted that he’d make the South Koreans pay for its deployment. The Saudi deal, said to be worth roughly $350 billion over the course of the next decade, has been a long time in the making, with Jared Kushner getting a lot of the credit for its orchestration. “Let’s get this done today,” Kushner reportedly said on May 1st when a Saudi delegation met at the White House. “At Lockheed Martin, we are proud to be part of this historic announcement that will strengthen the relationship between the United States and the Kingdom of Saudi Arabia,” said Lockheed Martin Chairman, President and Chief Executive Officer Marillyn Hewson in a statement. Previously, the Obama administration had put a hold on some of the weapons that the US would sell to the Saudis over human rights concerns. Various types of precision bombs were no longer being sold to the country over fears that the Saudis would use those munitions to target civilians in Yemen. But Kushner and Trump have freed up those old restrictions and opened the floodgates to let the money pour in.